If you’ve ever visited the Lone Star State, you may be aware of its unique and fascinating history, which dates back at least to 1860’s cattle drives, where vast numbers were driven 10 to 15 miles a day overland from 25 to 100 days, depending on the weather. Southern US cattle production was devastated by the civil war, but Texas longhorn cattle was unaffected. There were packing houses in Kansas and so trail drives were organized to deliver beef there. Cattle herds tend to move in single file on the trail, strung out in a long line. 1,000 head could range two miles in length. Millions of longhorn cattle were driven along the famous Chisholm Trail, named after Jesse Chisholm, who blazed the trail in 1865. 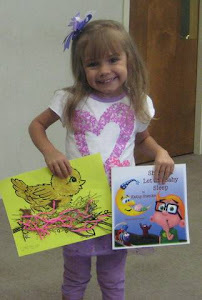 It ran from the Rio Grande River near Brownsville, Texas across the Red River continuing north to Abilene, Kansas. Chisholm traded with the U.S. Army and Native American tribes. A dozen men were used to drive a herd of 3,000. These drovers, called cowboys, worked in pairs, one on either side of the cattle. The best cowboys would work near the front helping to steer the herd, the remainder working further back, spaced out to the end. They communicated by hand signals or gestures with their hats. Also in the group was a Wrangler who managed the herd of spare horses, usually eight horses for each cowboy. The horses would be rotated so each animal could rest. If a thunderstorm broke out, particularly lightening, the cattle would stampede and the wrangler and cowboys would have to frantically round the cattle up, sometimes taking twelve hours. 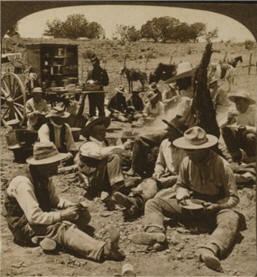 By 1871, as many as 5,000 cowboys were paid off in a single day. Between 1867 and 1872 alone, over three million head of cattle were driven up the Chisholm Trail from Texas to Abilene. A central fixture of the drive was the Chuck Wagon. Rancher Charles Goodnight invented this concept in 1866, believing more acceptable meals would ease the difficulty of procuring competent labour. 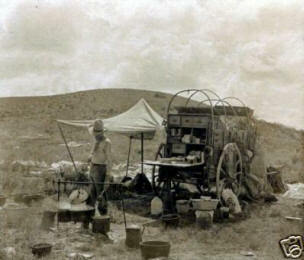 The chuckwagon, sometimes drawn by oxen, but usually by mules, carried food, utensils and a water barrel, as well as tools and the crew's bed rolls. A fold-out counter in the rear was used for the food preparation. There were compartments for foodstuffs. That modified wagon was built by the Studebaker brothers, who since 1852 produced wagons for farmers, miners and the military. Their sturdy wagons had steel axles to withstand trail drives. Studebaker expanded wagon production during the California gold rush, and further during the cattle- drive period. ( In the 20th century, the company evolved into an innovative automobile company, producing cars, trucks and busses until 1966). Since 17th century England, the term “chuck” has referred to meat or food in general. Part of a beef shoulder is also called chuck. Chuckwagon food always included sourdough breads and biscuits. A.big cast-iron Dutch oven with legs, and a flat, rimmed cover was used over hot coals. Biscuits could be literally baked in this oven. More coals could be placed on the cover providing bottom and top heat. The cook prepared meat, biscuits, dried fruit and coffee for breakfast and braised beef or stews, potatoes, beans, bread (risen from the sourdough starter) or biscuits and coffee for dinner. The cook, usually an older man ,was second in authority on drives. 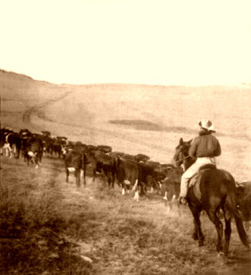 The era of cattle drives only lasted two decades, from the end of the Civil War to the mid 1880’s. During that time 10 million cows walked from Texas to Kansas and Missouri. Reasons for the decline of the cattle drives were newly invented barbed wire and the invention of the refrigerated railroad car by Gustavus Swift. The final blow to cattle drives were major blizzards in the midwest in the 1880’s whch killed millions of cattle in the feeder lots. The heyday of the long drives is probably the most coulorful in western American history. Today The American Chuckwagon Association exists, an organisation dedicated to preserving the heritage of the chuckwagon. Their members have cook-off competitions all over the USA and through these events, members educate the public on the history and tradition of the chuckwagon. Very interesting. I had no idea that the Studebaker brothers built the modified chuckwagon. I guess the only chuckwagons I have seen were on shows like Rawhide. MY JOURNEY WITH CANDIDA: The Studebakers built about 25% of all the chuck wagons but they were particularly noted for their sturdy quality. wow this is my kinda post. i didn even know beef shoulder is called chuck! lovely tradition and glad that it's still preserved in some way. Interesting history! Thanks for posting the pictures, too. THE JUNKIE BOOK: Glad you liked it, Thanks. THE GOLDEN EAGLE: I thought it was very interesting too, glad you liked the pictures. Fascinating bit of history and I do love history. I'm sure you're aware of how the term "The real mcCoy" came about as its related to cattle drives. Now I'm hungry for meat! STEPHEN TREMP: Thanks for calling. I've heard of that, plus McCoy pottery and Scots whisky. I wanted to write about Chuckwagon Chili but it did not apply to the trail drives.